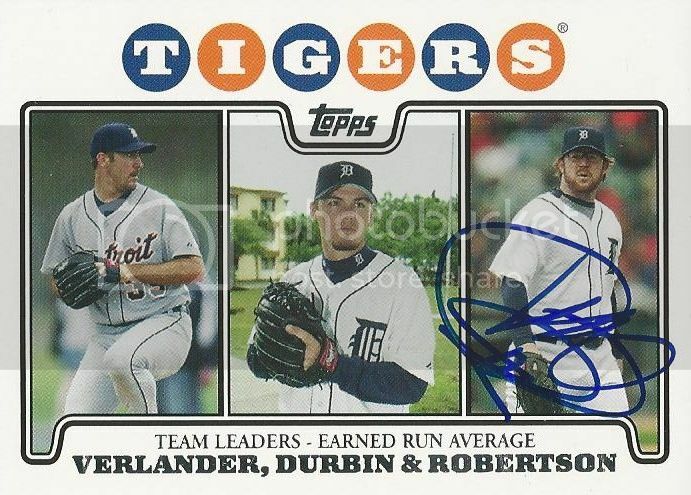 Nate Robertson has several cards in the 2008 Topps Detroit Tigers 55-card team gift set. A friend on SCN helped get three of them signed for us at a Round Rock Express game earlier this season. This one commemorates Nate as being third on the team in strikeouts. 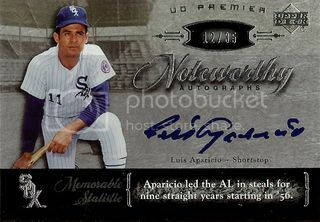 I won this Luis Aparicio card on Listia back in May. I don't go on there much but I happened to find this one for just 299 credits. That seemed like a pretty good deal for a black border parallel card from the 2007 Upper Deck Masterpieces set that's numbered 82/99 on the back. Since these repacks came to me from Matt at Once A Cub, I figured I'd do my own Repack Sunday! This was a prize for leading our Fantasy Baseball League in wins. All three repacks I got included one hundred random cards and four unopened packs. The unopened packs were the same in all three. 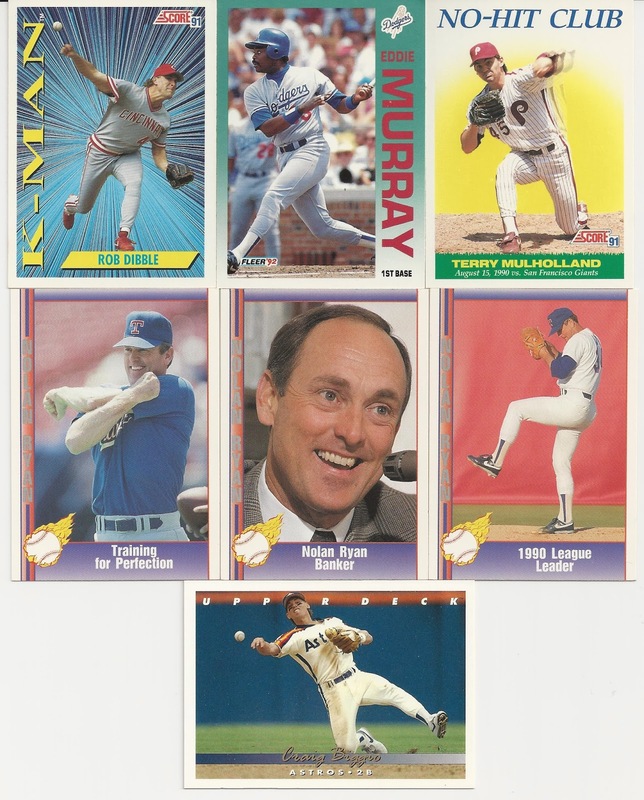 A 1989 Topps jumbo pack, two packs from 2008 First Edition and a 2007 Fleer Ultra. When Matt does these repack breaks he always shows off the future/former/current Cubs. This is a little harder to do for my favorite team, the Diamondbacks, since they weren't around before 1998 but I wanted to give it a shot. 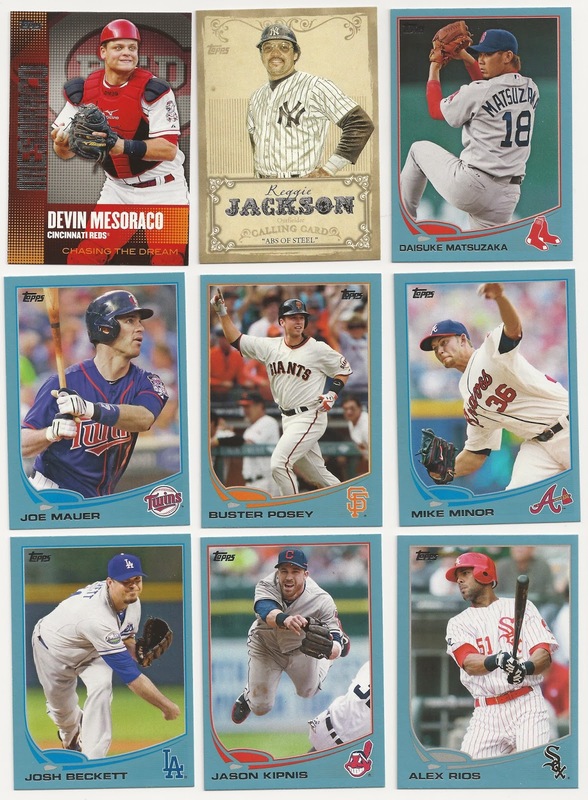 Only one card of a player actually wearing a D-Backs uniform in this one and it's of Miguel Montero. I was surprised to get two older Devon White including his iconic 1988 Topps Rookie Cup card. 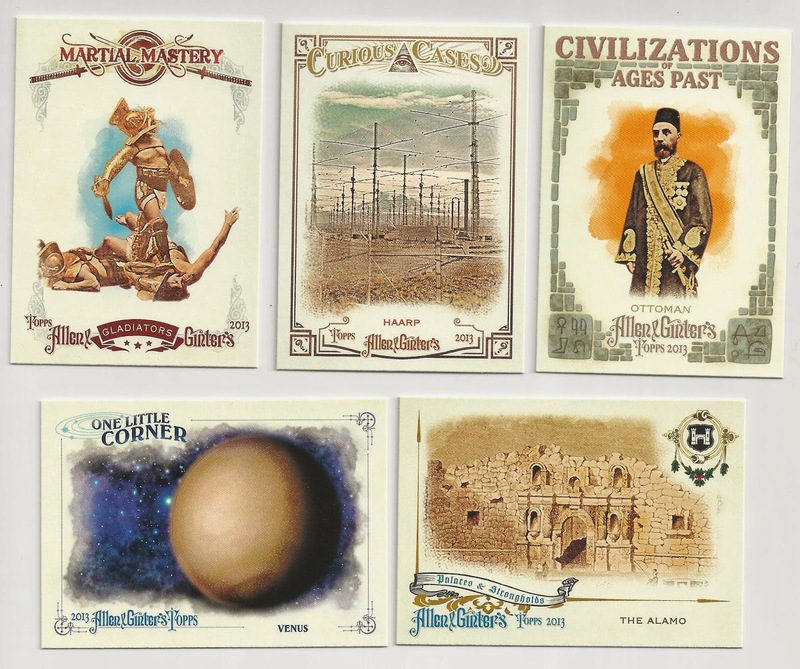 The Bernard Gilkeys are nice too. 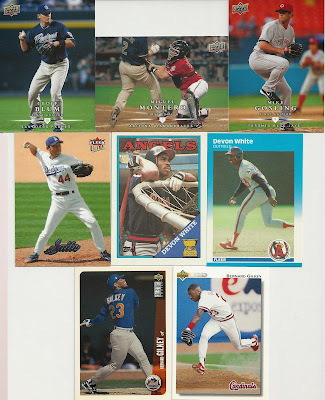 Here's a few Hall of Famers and some other cards that I just thought were nice. I really liked the early 90s subsets like the Rob Dibble K-Man and Terry Mulholland No-Hit Club. Matt always shows off anyone with Cubs ties. I went with just the guys wearing a Cubs jersey. Calvin Schiraldi and Shawon Dunston were both on the Cubbies when they made the playoffs in 1989. 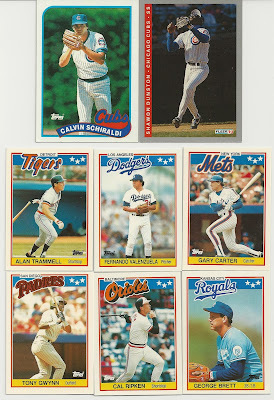 These repacks seem to have a ton of these old UK 1988 Topps cards. Lots of good names here. 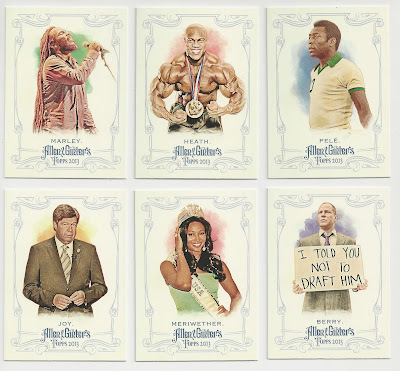 My favorite is the Gary Carter. This is the second of the two blasters I won in the Fantasy Baseball League. 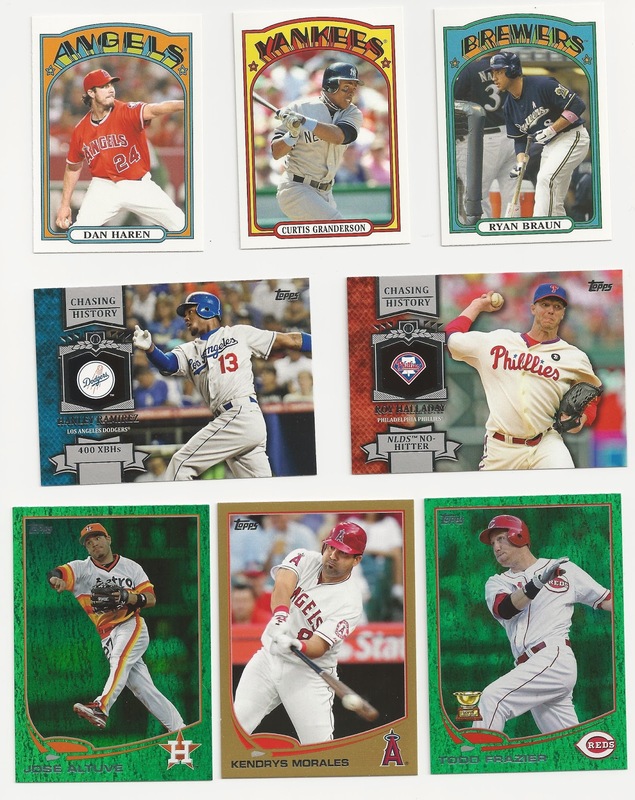 Remember 2013 Topps Series One? 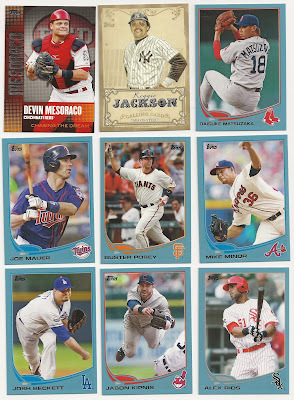 It was kind of fun going back and opening the first 2013 Topps cards. Nothing too exciting but the manufactured patch was pretty cool. Yu Darvish! If anyone needs any of these inserts everything but the Darvish is available. Just let me know. This is the first of two blasters I won in the Fantasy Baseball League. I didn't buy any Allen & Ginter this year so pretty much everything in here was new to me. 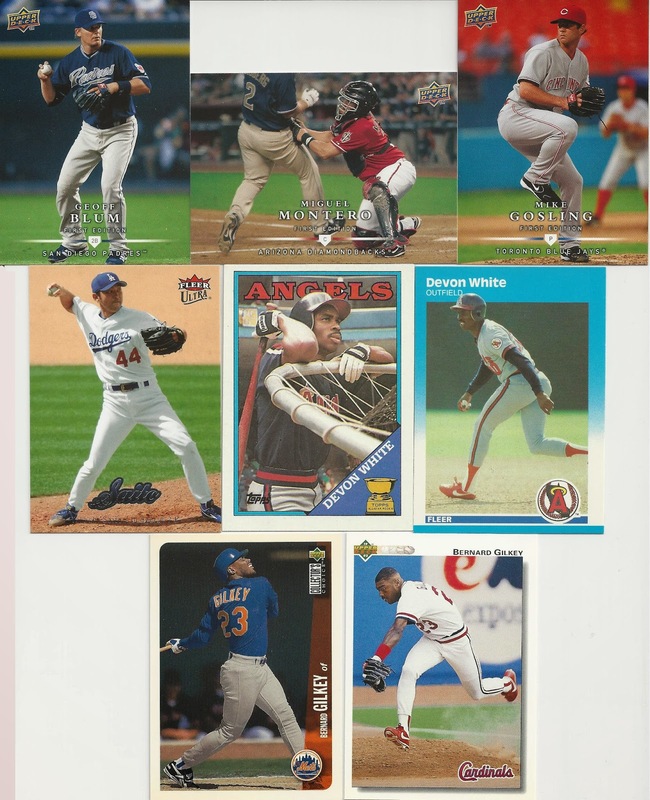 I only got one Diamondbacks player (Trevor Cahill) but I did get a bunch of cool non-baseball cards. My favorite is the Matthew Berry. A Matthew Berry card as part of a Fantasy Baseball prize package? Ridiculous! I also got a bunch of minis. I don't really like minis so they're available for trade if anyone wants them. Same with the other cards below. Anyone need the Alamo or Venus? If you still need any of the base cards, let me know and I can check to see if I have them too. Earlier this year I joined the Fantasy Baseball League that Matt from Once A Cub was setting up. 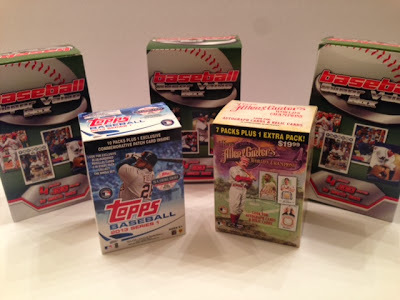 For a small buy-in, you had a chance to win some awesome baseball card prizes. After a late season surge my team climbed from third place and into the top spot. I was able to take over first place despite having a few of my key players on the DL. Yes, Carlos Gonzalez, David Wright, and Jason Grilli I'm talking about at you. Winning first place assured me at least one blaster as a prize. Finishing in first place earned me a bye week for the first round of the playoffs. In the second round I would be facing off against Mr. Once a Cub himself. Matt beat me in a close match-up and my chances at a league championship were over. All hope wasn't lost as I would be facing Roy from plain grey swatch in a match-up for third place. In another close battle, my team came out on top. This victory earned me a second blaster. In addition to the blasters for finishing in the top spots, Matt threw in some repacks to those who led the league in the ten different categories during the regular season. I came out on top in strikeouts, wins and batting average. More cards for me! Yes! Over the next few days I'll show off what I got in all of the goodness below. Thanks again, Matt! My October 2013 Loot Crate came today! 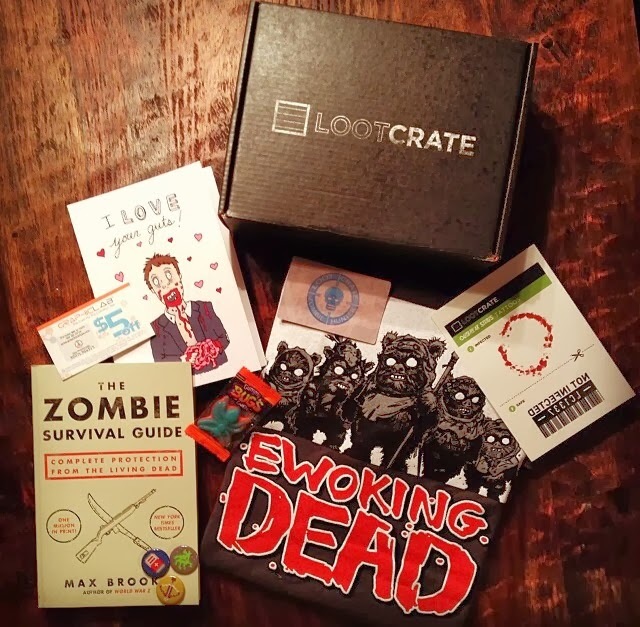 A few months ago I signed up for a monthly subscription box service called Loot Crate. Basically for less than $20 a month they'll send you a box of random, nerd stuff. I've gotten six so far and it's a lot of fun. If you're interested in signing up use this link. You'll save three bucks, I'll save a few bucks too and we'll both be happy next month when the mailman brings us the November Loot Crate! 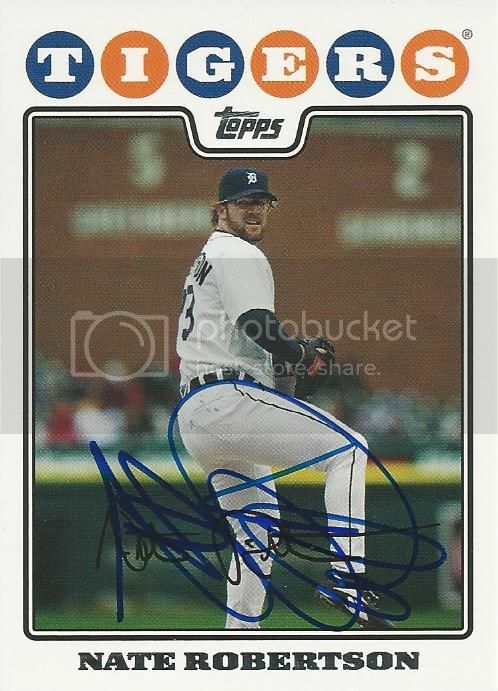 Nate Robertson has several cards in the 2008 Topps Detroit Tigers 55-card team gift set. A friend on SCN helped get three of them signed for us at a Round Rock Express game earlier this season. This one commemorates Nate as being third on the team in ERA. I picked up a 2013 Topps Heritage Minor League team set of the Diamondbacks off eBay for a couple of bucks the other day. 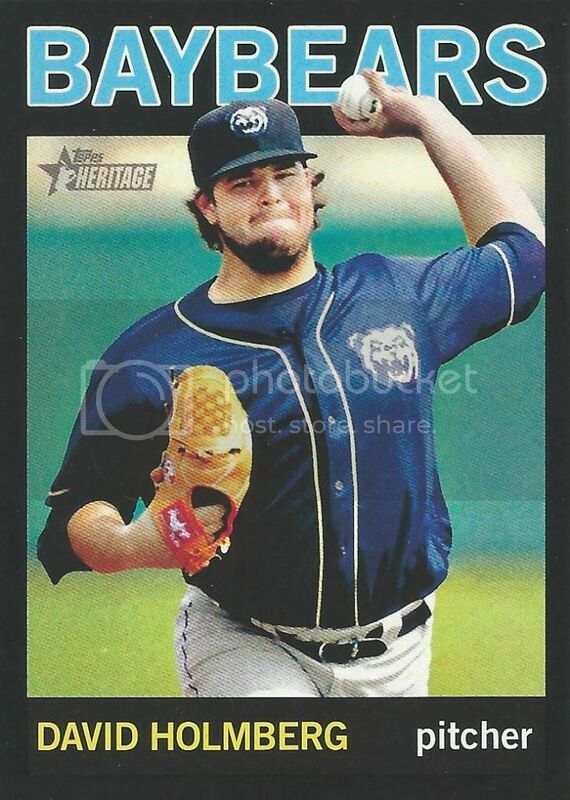 The seller also had this black border parallel card of David Holmberg. For an extra buck and free combined shipping I had to have it. 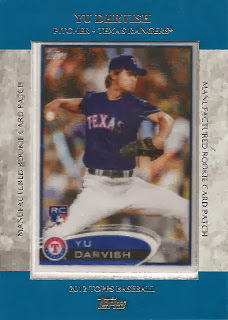 In that blaster I bought last night of 2013 Topps Update I got one of the usual manufactured patch cards. I looked over the checklist before I opened the special pack and there wasn't any one card that jumped out at me as a must have. Then I saw the Clayton Kershaw I got. It's his 2008 Topps U&H card. Awesome addition to our 08 Topps collection. Yes! 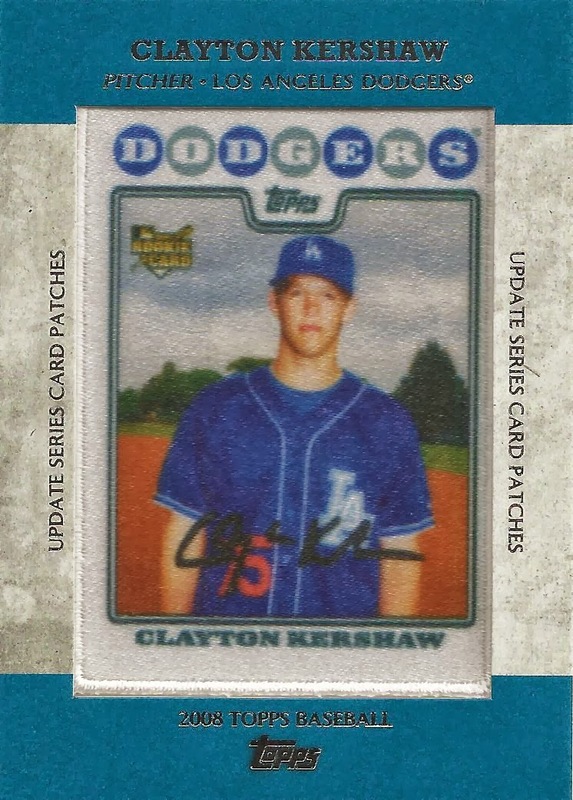 I went to Wal-Mart tonight and found a ton of 2013 Topps Update. I bought a blaster and a rack pack. I guess I chose well because I got this Jose Bautista jersey card in the pack. 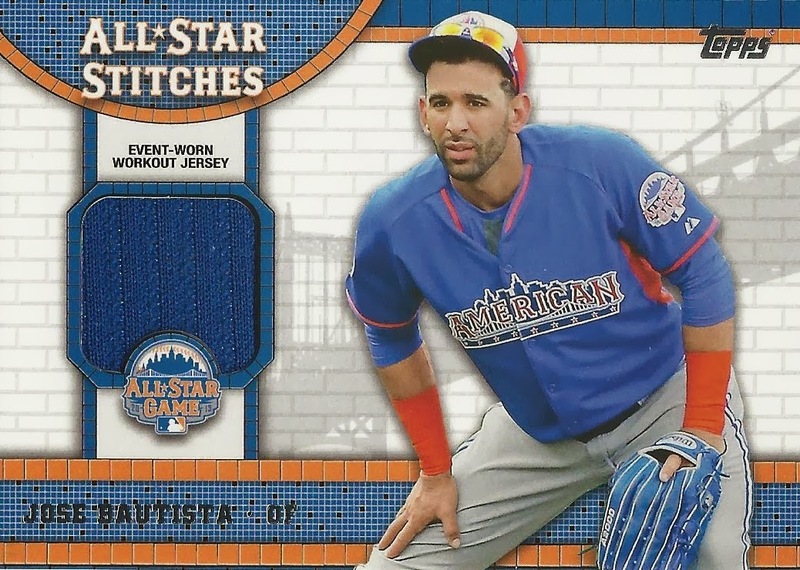 As usual the design on these All-Star Stitches cards is pretty nice. 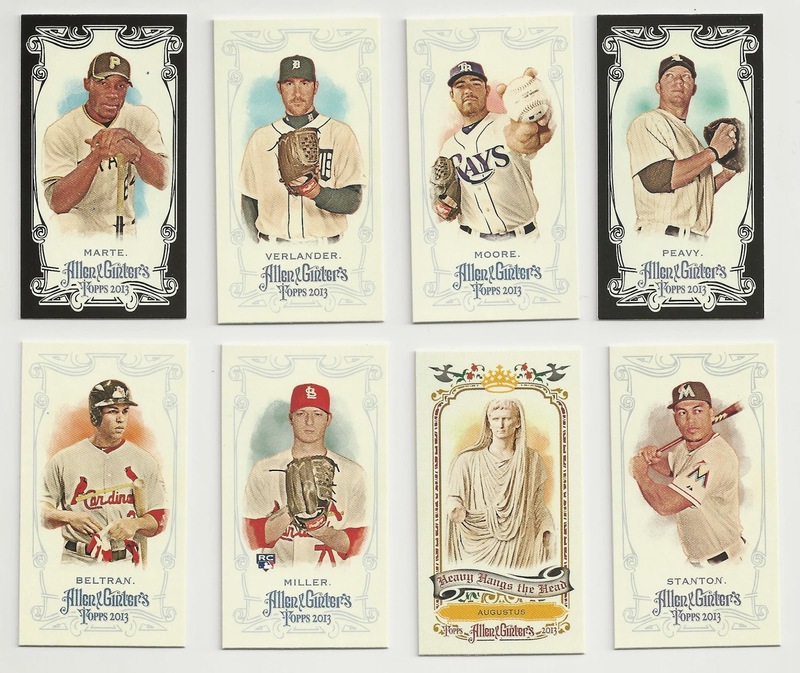 I'm going to have to track down the Paul Goldschmidt and Patrick Corbin ones for sure. I wish I had some 2013 Topps Update cards to post but my Wal-Mart and Target shelves were empty last night. I'll probably try again this afternoon. 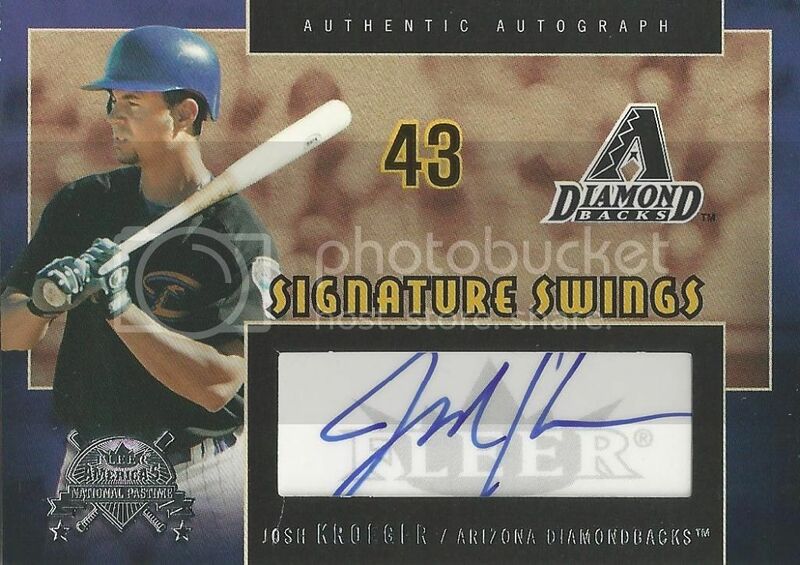 While we wait, please enjoy this Josh Kroeger certified autograph from the 2005 Fleer set. Don't remember Josh Kroeger? That's okay. He only played in 22 games for the Diamondbacks back in 2004. Since then he bounced around to a few teams but never made it back to the big leagues. I don't see that he played anywhere in 2013 so he might have retired recently. 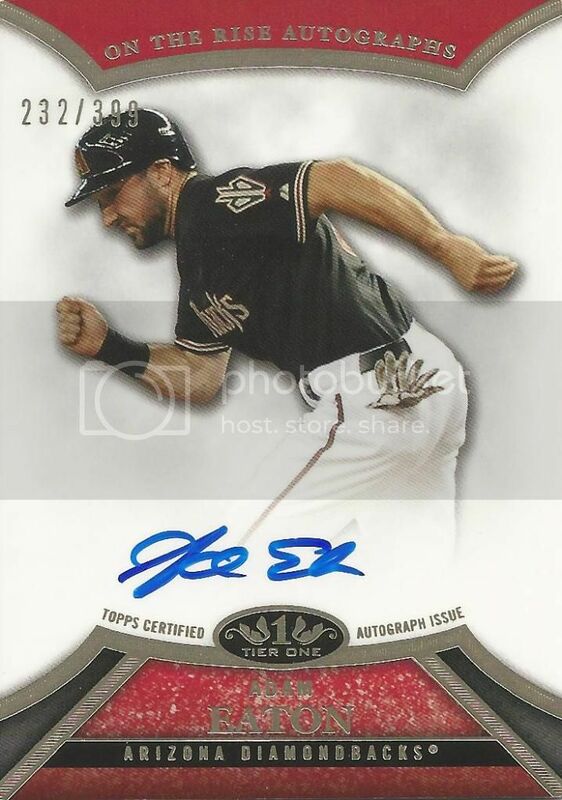 I picked up this card for less than $2 for our D-Backs autograph collection. Oooh a redemption card! 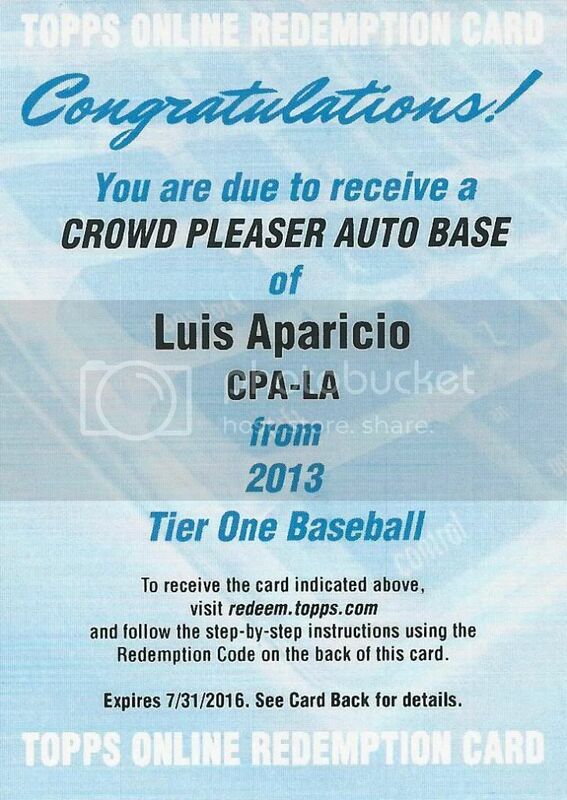 This one is for a Luis Aparicio Crowd Pleasers autograph from the 2013 Topps Tier One set. Hopefully in a few months I'll have a super cool auto of Lil Luis to post. For now enjoy this plain looking redemption card. They are a little better this year than back in 2011. Much like Tyler Skaggs, Adam Eaton has a ton of certified autographs out there. Adam's stock has fallen a little after being injured for most of the season. Those two things combined have lead to some cheap prices on eBay. 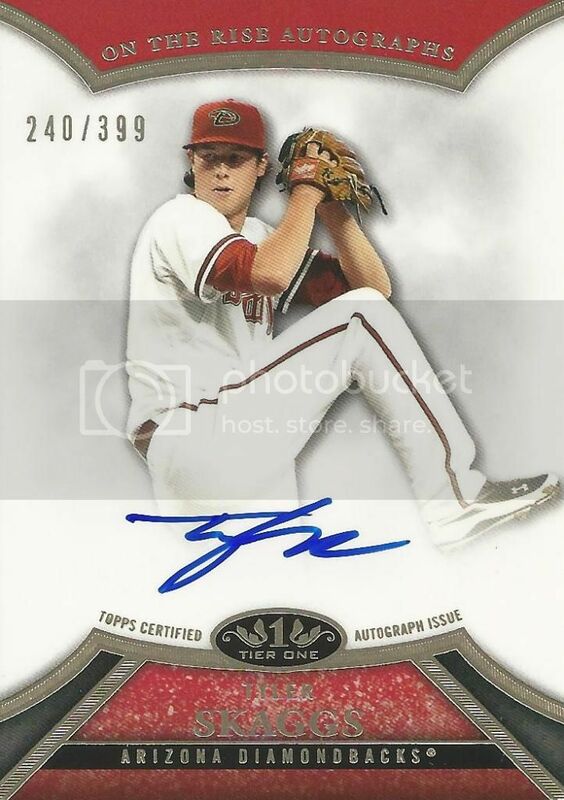 I picked up this 2013 Topps Tier One certified autograph from the same guy who had the Tyler Skaggs I posted yesterday. This one set me back just over $2 shipped too. A great price for a great looking card. Tyler Skaggs has a ton of certified autographs out there. Tyler's stock has fallen a little after not making an impact at the big league level this season. Those two things combined have lead to some cheap prices on eBay. I picked up this 2013 Topps Tier One certified autograph for just over $2 shipped. A great price for a great looking card. 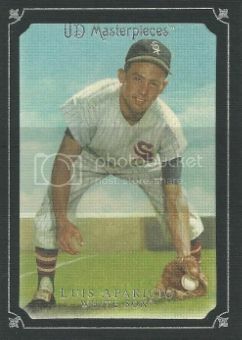 It's been awhile since I've posted a card from our Luis Aparicio collection but we've got a good one for today. It is a certified autographed card from the 2007 Upper Deck Premier set. It's numbered to 12/35 on the front. 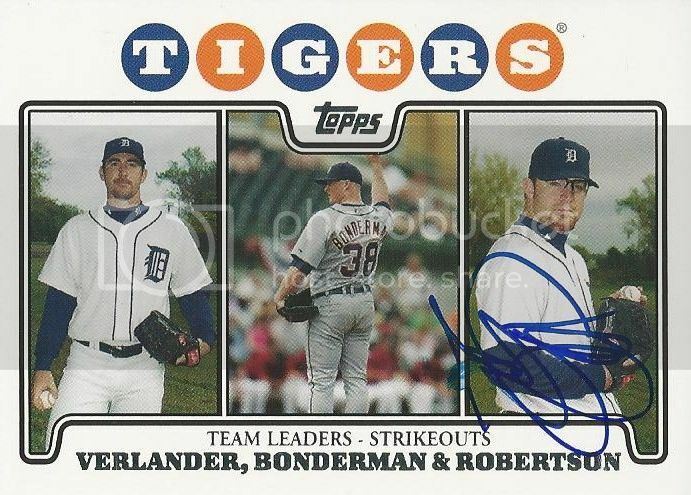 Nate Robertson has several cards in the 2008 Topps Detroit Tigers 55-card team gift set. A friend on SCN helped get three of them signed for us at a Round Rock Express game earlier this season. Not too long ago, Dennis from Too Many Verlanders sent this great card over. 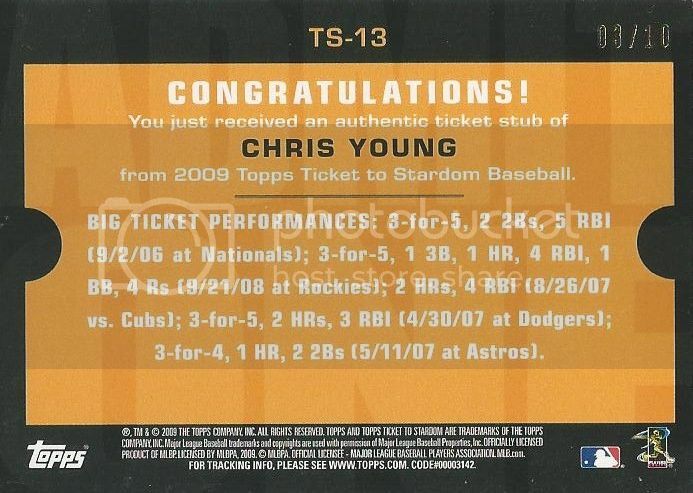 It's a Chris Young from the 2009 Topps Ticket to Stardom set. The gimmick of putting part of a ticket stub didn't catch on but I really like these. I liked it even more when I turned it over and saw it was numbered to only 10 on the back. Thanks, Dennis! 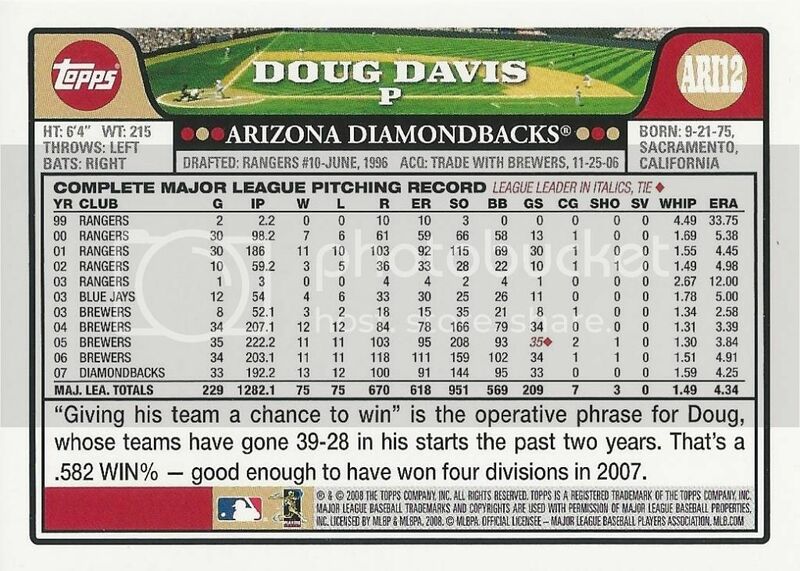 I almost forgot about the other card that Doug Davis signed for us at the Diamondbacks Alumni Meet and Greet last week. 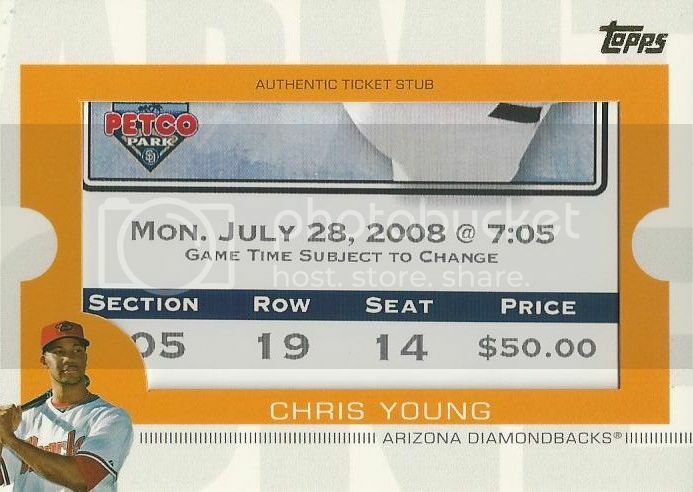 It was his card from the 2008 Topps D-Backs 14-card team set. 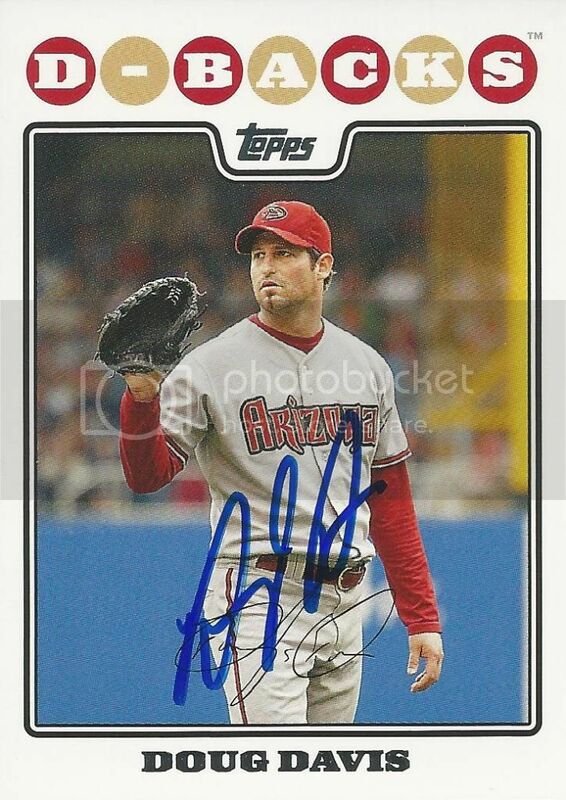 Back in 2010, Doug signed his regular 2008 Topps card for us during Spring Training. 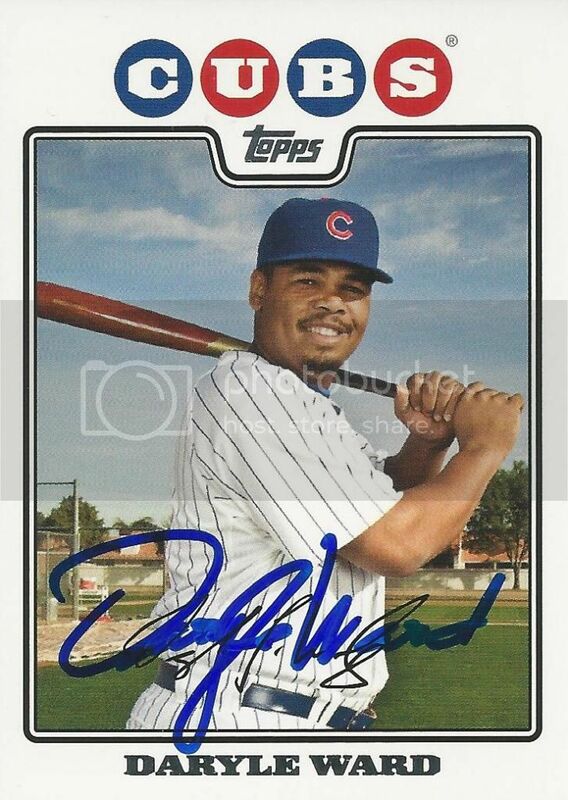 It was our 233rd signed 08 Topps card. You can check out that post here. I was able to get a few autographs from current Diamondbacks players at the game I went to on Friday night too. 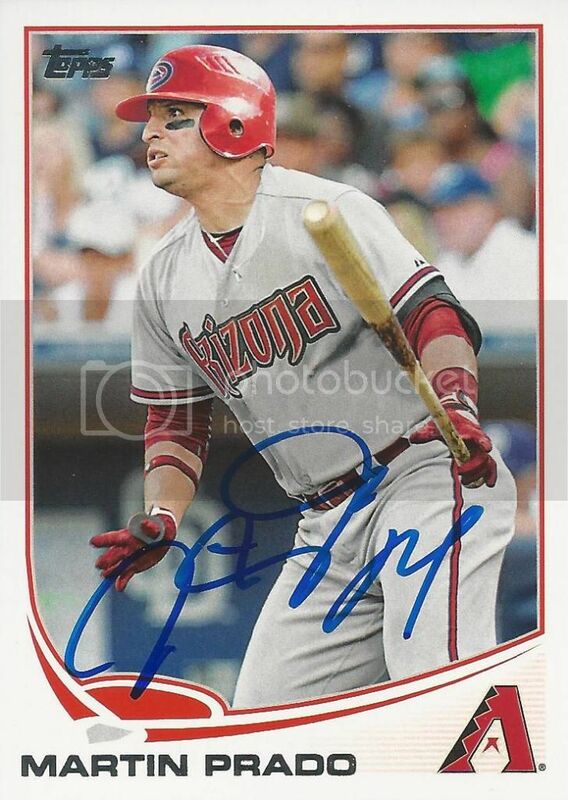 The best was this one of Martin Prado. Martin signed his 2013 Topps card for me. Brian from 30-Year Old Cardboard actually sent this card to us a few weeks ago. Thanks, Brian! I didn't buy much Series 2 this year so I wouldn't have had this card otherwise. It goes straight into My D-Backs Autograph Collection.